thoroughly heated. Serve with melted butter, spicy tomato relish or shallot cream sauce. 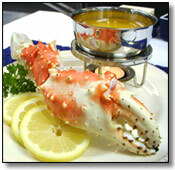 crab legs on high 2 to 2-1/2 minutes or until thoroughly heated. Rotate dish 1/4 turn every minute. teaspoon bottled hot pepper sauce and dash garlic salt. Do not purée mixture. Shallot Cream Sauce: Sauté 3 tablespoons minced shallots or onion in 1 tablespoon butter or margarine until softened. Stir in 1 tablespoon flour and 1/8 teaspoon each crushed dill weed and pepper. Cook and stir about 1 minute. Blend in 1/2 cup dairy sour cream; salt to taste.